Winner! Most Outstanding Martial Arts School In North America! Classes offered in Jeet Kune Do, Kickboxing, and Grappling. Corporate classes available. Give your child the opportunity to be a leader, not a follower by developing respect and discipline. Private training for serious students, busy students, targeted training, and more. In 1985 NY Martial Arts Academy was the first school in the tri-state area to teach Jeet Kune Do. Since that time, there have been over 10,500 students trained at our academy. Through the years we have maintained our high standards through small group lessons, personalized attention, and constant interaction with our students. 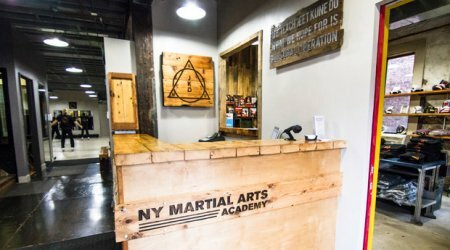 NY Martial Arts Academy provides a total Martial Arts experience. NY Martial Arts Academy was the first school in the tri-state area to be recognized by the Jun Fan Jeet Kune Do Nucleus (an organization established to preserve and perpetuate the art that Bruce Lee developed). This organization consisted of Bruce Lee's wife, daughter, first generation, and second generation students. This organization and our school have a common purpose to promote the art, science, and philosophy of the founder of JKD (Bruce Lee). We are one of the only schools on the East Coast to teach Jun Fan Jeet Kune Do. This is also an academy that will teach you the different aspects of Jeet Kune Do (mind, body, and spirit). You will also develop friendships and a common respect for your fellow martial artists.